New furnaces are up to 40 percent more energy-efficient than 20-year-old furnaces. That translates to less environmental impact and lower energy bills. 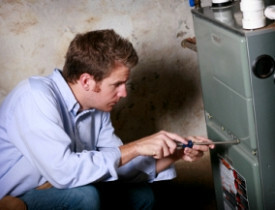 An efficient furnace can pay for itself in just a few years; then you will start saving money. Below are shopping tips for buying a new energy- and cost-efficient furnace, and some good options. Look for the annual fuel utilization efficiency rating, which is the percentage of fuel energy converted to heat. New furnaces are rated from 78% to 96%, up from the 60% for older models. Also look for the Energy Star label and a Consortium for Energy Efficiency (CEE) rating. Both require more than 90% efficiency. CEE-approved models may qualify for rebates from your utility or regional energy organization. Furnaces that exceed 90% efficiency save fuel by condensing and reusing the water vapor that goes to waste in most furnaces. Variable-speed fan motors save electricity. These upgrades can make the furnaces significantly more expensive, so they are often only cost-effective in extremely cold climates. In milder climates, the cost savings and energy savings may be negligible. Most furnaces are oversized. Conduct an ACCA Manual J analysis to make sure a new furnace is properly sized for your square footage and heat-loss levels. Oversized equipment uses excessive energy, is noisy and may wear out faster by cycling on and off frequently. Also, install the furnace in an insulated, conditioned space with plenty of room for access and airflow. The CEE rates the Coleman Echelon at 98% efficiency. Johnson Controls also manufactures similar models under the Luxaire Acclimate and York Affinity brands. While condensing water vapor and using variable-speed fan motors, these furnaces also generate heat in one-percent increments to optimize comfort levels with minimal energy. Wood pellet furnaces efficiently burn biomass, such as agricultural waste or scrap wood. They are ideal for homes in rural or remote areas with abundant biomass and access to wood pellets but without easy access to natural gas or heating oil lines. Pellet furnaces are typically less efficient and may be more polluting than other furnaces. All-electric furnaces are the only models that reach 100% efficiency. However, the higher cost of electricity in most areas makes them cost-prohibitive. Moreover, standard coal-fired electric plants are closer to 30% efficiency, so it is probably better for the environment to efficiently and directly convert cleaner-burning natural gas to heat. Solar-powered electric furnaces in off-grid homes may be the exception to the no-electric rule. However, they require large solar arrays, which are expensive. They also require backup power sources because sunlight hours are shortest in winter, when you need the most heat. Geothermal furnaces are another renewable option with zero emissions and high efficiency. They draw underground heat and distribute it throughout the house. Like solar power, geothermal power is free, but it involves sizable up-front costs. Look for highly efficient furnaces. They can pay for themselves in short order through lower utility bills. Also consider renewable power options for some circumstances.